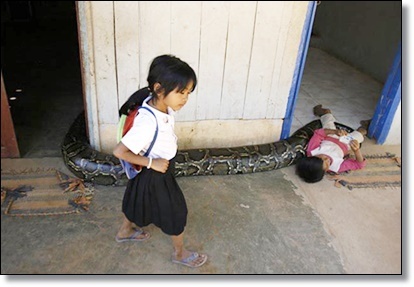 Setbo Village, Cambodia - Being responsible parents, rice farmer Khuorn Sam Ol and his wife might not be expected to be keen on having their child play with a 16-foot-long, 220-pound snake. Yet they are unflustered that their 7-year-old son, Uorn Sambath, regularly sleeps in the massive coil of the female python, rides the reptile, kisses it and even pats it down with baby powder. "There is a special bond between them," Khuorn Sam Ol said. 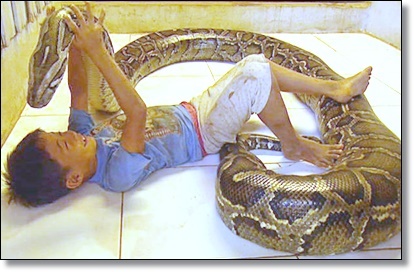 "My son played with the snake when he was still learning to crawl. They used to sleep together in a cradle." 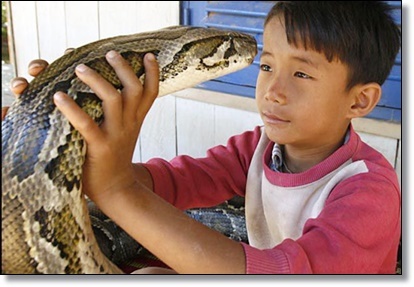 The boy and his snake have become a tourist attraction in Setbo village, about 12 miles south of the capital Phnom Penh, as well as a source of wonder to the locals. 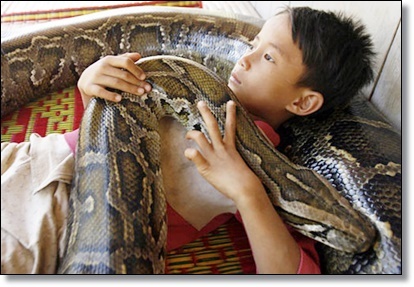 "People sometimes call the boy and the snake husband and wife," said Cheng Raem, a 48-year-old neighbor. "Maybe they were a couple from a previous life." 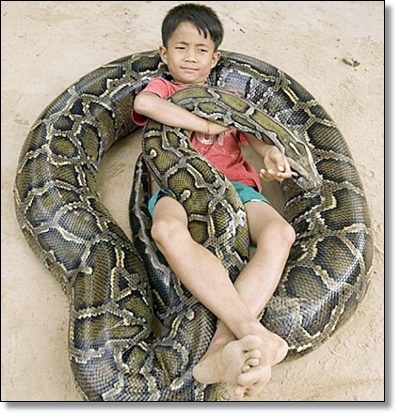 Boy and snake grew up together, ever since the python slithered into the family home when Uorn Sambath was 3 months old. His 39-year-old mother, Kim Kannara, discovered the reptile, then about the size of a thumb, coiled beneath a woven mat on their bed. 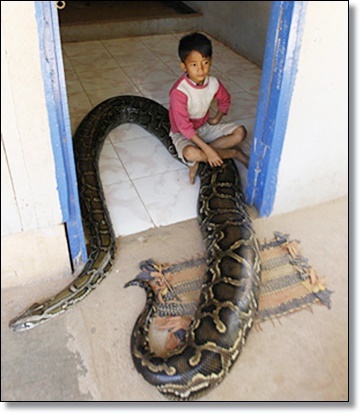 Khuorn Sam Ol took the snake away, releasing it into some bushes by a river, but one morning two weeks later, he found it back inside the house. He decided to keep it and named it Chamroeun — meaning "progress," in English. He came to believe the snake possesses a magical spirit that understands what he says and protects the family from illness. 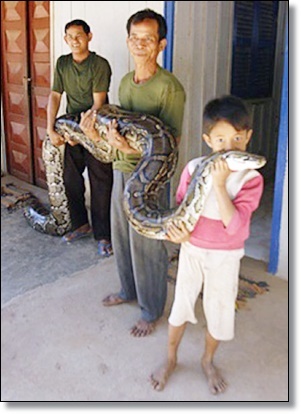 The snake has its own 7-by-10-foot room with a spirit house at which Khuorn Sam Ol prays for the python to keep his family happy and healthy. The snake is so familiar with his son — one of four children — that it would never hurt him, he said. According to Nikolai Doroshenko, a Russian snake expert living in Cambodia, it's true that pythons rarely attack humans unless provoked. 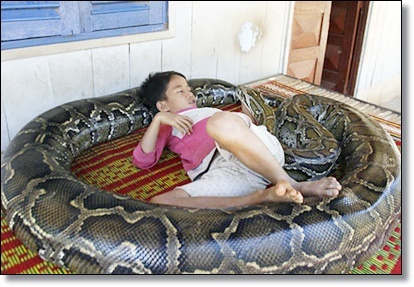 But there is still an element of danger in allowing any young child to play with a large python with a grip powerful enough to break bones, said Doroshenko, who runs the Snake House guesthouse in the southwestern city of Sihanoukville, with its own collection of snakes and other reptiles. Chamroeun — whom it takes three adults to carry — eats about 22 pounds of chicken meat every week, posing a heavy financial burden on the family, said Khuorn Sam Ol. His meals used to be a spiritual burden as well, when they fed him live rats and chickens. Uneasy that they were breaking the Buddhist injunction against killing living things, Khuorn Sam Ol said the snake eventually answered his prayers for it to stop eating live animals. Wildlife and police officials used to come by to try to take the snake away and put it in a zoo. 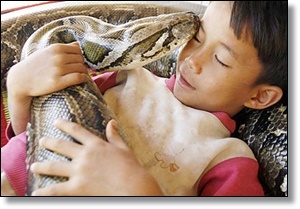 But they relented after seeing Uorn Sambath lovingly cuddling the reptile. 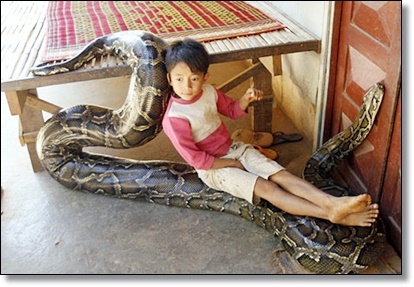 They left with some pictures they took of the boy and the snake together, Khuorn Sam Ol said. "I will not let anyone take her away from me, either. I love her very much," declared his son, Uorn Sambath, kissing his pet on the head.